Hema’s right. Using different kinds of fabrics for household tasks offers even more options for saving money and the environment. Men’s worn-out tee-shirts work great for many cleaning tasks, and the fabric from cotton shorts or briefs can be used as well. 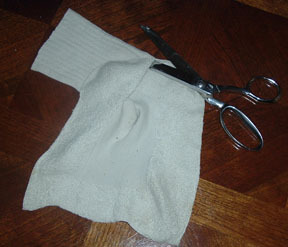 The trick is to properly cut the garments into usable pieces by trimming off elastic and seams. I like to remove a tee-shirt’s neckband and sleeves first and then slice the tube into 2 large pieces by running scissors straight down from the armholes to the hem. These sections can then be cut into smaller sections, depending on how the rags will be used. White cotton shorts and briefs can be harvested in the same way by cutting off the elastic and seams. I’ve even done this with women’s cotton bikinis, but the resulting scrap of fabric is so tiny, its usefulness is limited to polishing intricate silverware or similar tasks. My friend Joan cuts non-textured all-cotton tee-shirts and underwear into squares and uses them to dry eyeglasses when she washes them. “They’re soft, absorbent, and lint-free,” she says. When I had babies years ago, cloth diapers came only in squares–even the so-called “prefolded” ones whose main feature was a rectangle of layered fabric in the middle. I’ve never tried repurposing the new diapers that come with gathers and Velcro. Perhaps one of our readers will enlighten us concerning those possibilities. 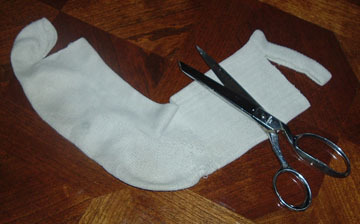 Cut off the socks’ toes and tops of the cuffs. 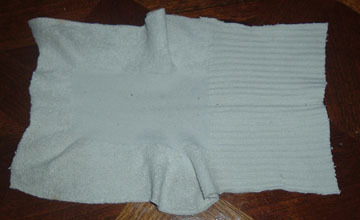 Many folks like to slip socks over their hands to use as dust mitts. This is also a handy tip when polishing shoes or performing other messy tasks that don’t require too much finger dexterity. Slice the tube up the back, from the heel. But you don’t have to leave socks in one piece. They can be cut into squarish cloths by snipping off the cuffs and toes and slicing the tubes up the back. End up with a squarish rag for cleaning and polishing. A non-cleaning project for old or solitary socks is to make them into hand puppets. When Aimee was little, I fashioned “Gertrude” out of a tan acrylic sock, gave her ball-fringe hair and button eyes, and kept her handy whenever we went on an outing. During boring moments, Gertrude would emerge to sing, tell stories, and talk with Aimee and any little companions who might be along. The fabric from 100% cotton shirts can be used in the same way as sheet rags, but even if the fabric is treated to resist stains and moisture, you can salvage sections for crafts and protective uses. At the very least, snip off and save the buttons before you toss out any clothing that cannot be given away or repurposed. Practically any sturdy material can be turned into what I call “oil” rags. These pieces of fabric can be disposed of after they’ve wiped a dipstick clean, have been soaked with paint or glue, or have otherwise given up their useful lives in service to your household. A classic way to repurpose fabric is to turn the scraps into quilts. Denim makes durable picnic quilts that stand up to a lot of rough use. If you aren’t a quilter yourself, you may know someone who would welcome your fabric squares for such a purpose. Joan suggests cutting squares from old favorite sweatshirts to make snuggly afghans. The fabric doesn’t ravel, so you can just stitch the squares together and snip the afghan’s outside edges into a short fringe. Old nylon netting can form hammocks for stuffed animals or can be gathered into scruffies for cleaning tubs and sinks. Retired sleeping bags, unzipped, can serve as bed comforters in a pinch. If you want a more permanent solution, remove the zipper and sew blanket edging all around. Sleeping bags also keep groceries cold in the car or rising bread dough warm in the kitchen. Fabric can be repurposed into a myriad of decorating options. When it’s time to wash those cleaning rags, I’ve found that hot water, detergent, bleach, and a double rinse cycle gets them hygienic and smelling great. Gertrude, however, prefers a warm bubble bath. This entry was posted in Resourceful Recycling. Bookmark the permalink.